So, you've probably heard by now that Ted Roof, PSU's one-year Defensive Coordinator, has resigned and taken the DC job at Georgia Tech (his alma mater and prior employer). Secondary Coach John Butler has been named has his replacement. I have not seen any definitive information about who will replace Butler. Roof's departure is a little surprising, but not shocking. Roof is no stranger to moving boxes and 401k roll-overs, having been, in the last 13 months alone, on 4 different payrolls. But the timing is a little odd (but not too odd, considering PSU's current situation) as LOI signing day is just 3 weeks away. Roof proved to be a competent recruiter, adding some ties to the south, and headed up a decent defensive effort during his one season with the Lions. I didn't (and still don't, really) want to like Ted Roof - due the public's sentiment against him and some mostly petty reasons (but are they?). In the end, I found that I really didn't care that much about him, one way or the other. I'd get twinges of dislike here and there, but also moments of empathy/tolerance/whatever. The fact that he's left PSU after 1 season, to me, is a mere technicality, I'm not going to read too much into it or wish him ill. We may lose a current recruit or two, but it doesn't seem like it will have too great of an impact on the team. Similar to my fellow fans, I had serious concerns about Roof's actual coaching record, but also about what sort of atmosphere this new coaching staff would create. In the end though, I believe that the coaches were more affected by the atmosphere created by the players (and fans) this past season. So, like I said, I'm really not glad or sad that Roof has left. But I am seriously surprised that his replacement (and so quickly) is John Butler. I don't think it's totally clear as to when Roof "left" but Butler's promotion seems to have been a decision made quickly and without much hesitation. Coaching the secondary is completely different from coaching the front 7 - the players, game plans, and even film are just different. Per his resume, Butler has had some success coaching a variety of positions on the defense - and this will, hopefully, help him with relating to players and devising his defensive schemes. 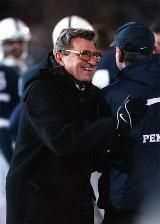 He has, in his short time at Penn State, shown a real passion and commitment to the team, recruiting and his job. The secondary was a real concern when he was hired - and although they weren't perfect by any definition, they were dependable and nowhere near the liability we had feared. Only time will tell. Butler seems to be a bit of an O'bie fan boy and, obviously, untested in the Coordinator (defensively anyway) role - but his success will be our success so naturally, we wish him (quite) well. Also, this probably means that photo ops will increase 10 fold, which is only a good thing. UPDATE: Per "sources" Roof & O'Brien had their talk yesterday, and the decision to promote Butler was made very quickly. And we have a winner; Michael Mauti is 2theLion BCS Champion! Michael Mauti has been selected as the Bestest, Cutest, and Smartest Penn Stater! And, I have to say, I fully agree. We also have winners for our "comment" contest - we'll be contacting the winners soon - thanks to all who participated and voted! It's the Final Match-up; 2theLion BCS Championship! The awesomeness of these two men is nearly immeasurable. Their contributions, both on and off the field are (and will remain) simply legendary. They each met with adversity and competition during their college careers and weathered both with stalwart strength and loyalty. Each, in his own way, lifted the team, and the fans, onto his respective back and carried us forward. Each has displayed ferocious leadership during times when it was most needed. And now we must choose.